Organized by Selman Akbulut (Michigan State), Anar Akhmedov (University of Minnesota, Twin Cities), Mehmet Firat Arikan (METU), Weimin Chen (University of Massachusetts, Amherst), Yasha Eliashberg (Stanford University), Cagri Karakurt (University of Texas, Austin), Tian-Jun Li (University of Minnesota, Twin Cities), Danny Ruberman (Brandeis University), and Nikolai Saveliev (University of Miami). 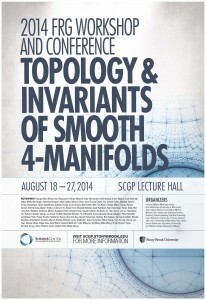 With the advent of gauge theories and the developments of symplectic topology and the 4-dimensional handlebody techniques, the field of 4-manifolds has experienced a period of phenomenal growth and development. By using gauge theory, Donaldson showed that smooth 4-manifolds are very different from their higher dimensional counterparts. For example, four is the only dimension in which a fixed homeomorphism type of closed 4-manifolds can be represented by infinitely many diffeomorphism types, and in which there exist exotic R^4, that is, manifolds homeomorphic but not diffeomorphic to R^4. Further results followed with the development of Seiberg-Witten gauge theory, which significantly simplified and extended use of gauge theory in the topology of 4-manifolds. Taubes related the Seiberg-Witten and Gromov-Witten invariants of symplectic 4-manifolds, thereby establishing a very important link between smooth and symplectic topology. Ever since, techniques from symplectic and contact topology have provided some of the most important tools in low-dimensional topology, making available a number of new invariants for the study of a large class of smooth 4-manifolds. 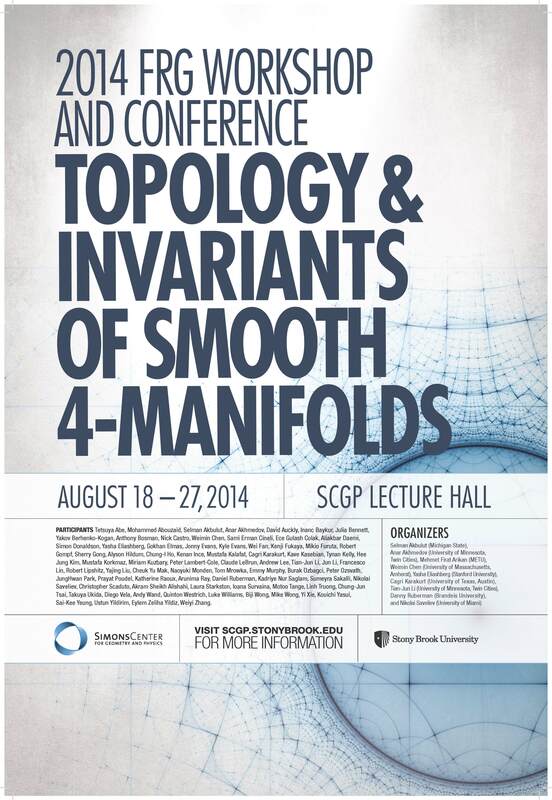 Our workshop will bring together leading researchers and graduate students working in the fields of three- and four-dimensional topology, gauge theory, contact and symplectic topology. It will expose graduate students to current topics in the above mentioned fields. The workshop will also provide an opportunity to initiate and enhance the interaction, exchange of ideas, and possible collaboration between the participants. There will be a six minicourses given by the experts in their fields. Tea time will either be in the Simons Center Lobby or on the patio outside of the Art Gallery (weather permitting) at 3:30pm.